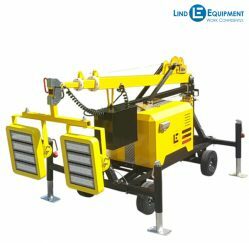 Portable LED Light Tower | Hy-Cor International Inc. 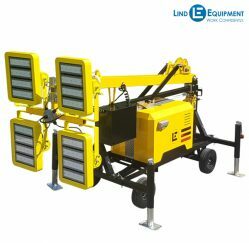 The Beacon LED Tower, using the latest in high-efficiency LED lights from Lind Equipment, can be operated on a small user-supplied ‘suitcase’ type generator, and still have plenty of power left over for other uses. With its built in additional fuel tank, the Beacon LED Tower can run for up to 45 hours before refueling. Whether operated from a small generator, or linked in to external sources of power, the Beacon LED Tower runs extremely silently. Operating costs of as little as $ 0.10 / hour and with state-of-the-art robust LED lighting, it’s virtually maintenance free. Internal Dimensions L:27" W:21" H:19.5"
Fuel Tank Dimensions L:19.3" W:12.2" H:10.2"
Features Comes complete with hose and fuel cap that will fit most popular suitcase generator models including Honda and Westinghouse. Removable tank. 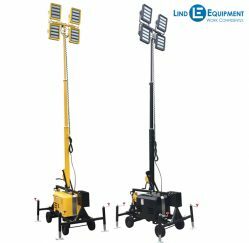 Your Portable Wide Area Lighting solution in one easy to use assembly. A very bright, industrial weatherproof LED flood light designed for the toughest locations. Built to withstand the rigors of a jobsite.